Istanbul is a such a huge city that even if you have lived there for eighty years there will still be areas and beauties you haven’t seen, shores you have not set foot on. For many one such place is the little fishing village of Rumeli Feneri, where the currents of Bosphorus merge and clash with the rough waters of Black Sea. It is a known fact that this village was named after the lighthouse erected there, Rumelifeneri, meaning the Lighthouse of Rumelia, but what is not known is how many times during the history people built a lighthouse at this village. It is believed that in ancient times there used to be a so called “ Pompeii Column”, with an eternal fire burning on top, directing sailors coming from the Black Sea to the European mainland called Rumelia.. The current lighthouse was built by Frenchman in the middle of nineteenth century. It is believed that under the area where the lighthouse was supposed to be built, an Evliya or a Muslim saint was buried and three times during the construction the foundation had collapsed. The French engineers listening to the locals decided first to build a turbe, a tomb for the saint, and then constructed the lighthouse as the second stage. In the following years the lighthouse not only guided seamen and fishermen safely to the shore but also became a worship place for people looking for a cure for their problems. But the main reason making me interested in the area is not the lighthouse but the so called clashing rocks or Symplegades which has a very interesting story in the mythology. It was even before the war of Troy when Jason and his crew of fifty volunteers including writers and poets like Herakles and Orpheus left Greece in search of the golden fleece. When they reached the waters of Bosphorus in their ship Argo they were cautious and scared what they had heard about the Amazon women. These were big and beautiful women who were good warriors and who had established their superiority over men ruling the the shores of the Black Sea region. A second concern of the crew of the Argo was the rocks of Kynea or Symplegades and the story they had heard from a wise man named Phineas while crossing the channel of Dardanelles. 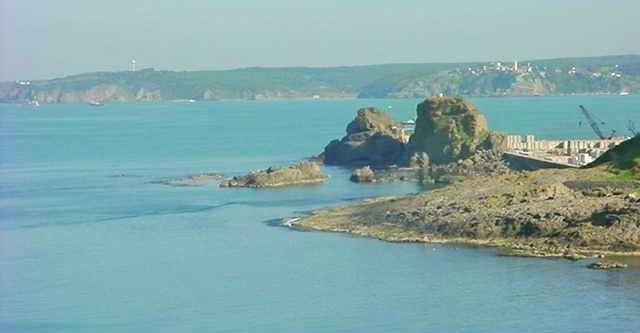 According to Phineas, where Bosphorus, which meant passage of the cow, met the rough waters of the Black sea, there were some rocks which always gave a hard time to the sailors and fishermen to pass through. The sailors always told their children for generations, that looking from a distance these rocks seemed to have a passage through them, but when you came close all of a sudden the sea would get rough, the waves would get high and the rocks would clash together and close the passage crashing the ships. The old man of Dardanelles told Jason that when they came close to the rocks to let a dove fly through the rocks and as the rocks opened up the sailors needed to row the boat with all their power and pass through the rocks in a hurry. Again according to the legend, as Jason let the bird fly through the rocks, the rocks started clashing but the dove was able to fly through leaving a single feather between the clashing rocks. When the feather fell on the rocks they suddenly opened up, not to be closed forever and Jason's ship Argo with his fifty sailors passed through to the waters of the Black Sea. It was about fifteen years ago when my good friends, Ayfer and Uret Yenicag took me with their car to a ride to Rumeli Hisari. On a beautiful September afternoon we drove through the steep ramps and green hills of Sariyer, passing through the Belgrat Ormanlari, the forest of Belgrade going by the ancient water dams and watching the breathtaking view of Bosphorus with an bird eyes view from top. As we drove further out from the city, all residential areas were disappearing, a single sheep or a cow was seen grazing in the pastures around us, giving one the impression that we were on a country road to a little village. On our left there was the campus of the Koc University, hidden well into the nature in full harmony. On our right the continuous wire nets were giving us the impression the existence of of a military zone. Finally we started driving down hill towards the ocean, passing through the little village of Rumeli Hisari which looked like it was still living the life of the 1960 ies. Most of the one or two story houses were painted in white or brick color. On our right by the the cobblestone street there was a lighthouse painted in white, rising to the sky like a small tower. Right next to the lighthouse there was this tiny mosque with one minarete, and a ceşme, the village fountain where women were filling up their plastic water containers. Little further down the village the coffee house was full of men playing backgammon or card games. At the shore line we noticed that the pierre was going under some renovation project , there were heaps of gravel and sand all around us. The ocean was lying like a big blue blanket, few fishing boats were wobbling lazily on it. I looked at the starting point of pierre where the road was coming to a dead end when I noticed this unusual rock formation, two huge rocks looking like a camel's hump. On the highest point of the rocks there was a white line, looking like a marble residue from the base of an ancient column. Right next to the rocks there was a little ma- pa type of restaurant . Using the wooden stairs laid on the rocks we went up to the little eatery called Roke restaurant, it’s name commensurate with the legend of the clashing rocks. The modest place had only eight or ten tables, most of them full with local sightseers and foreign tourists. Where the waters of Bosphorus and Black Sea merged in the horizon in streams and currents, there were quite a few fishing boats sailing. Suddenly they all started moving towards the mouth of the Black Sea leaving a distance between them and dropped down their fishing nets into the blue waters. September was the season of the Bluefish in Bosphorus and looked like the fishermen were going to get plenty of it. We ordered pan fried oysters, grilled bonito, arugula salad with fresh squeezed lemons. While sipping the ice cold Efes beer from our glasses we talked about the story of the clashing rocks which not to many people knew about.